Editor: Just like those neighbors who decorate for Christmas before Halloween, one political party in Loudoun has already prematurely started the 2019 campaign. The Loudoun County Democratic Committee leadership held a kickoff event Sunday night to announce their predetermined slate of candidates—months before a single primary voter could make their voice heard. In a move that can only be described as anti-democratic, Board of Supervisors Chair Phyllis Randall introduced her hand-selected group of Democratic candidates to run for local office. Many announced Democratic candidates were not featured at her event, which was followed by a press release on LCDC letterhead and included only Randall’s chosen candidates. The Democratic Party rigged the 2016 nomination for Hillary Clinton using super-delegates. Now in Loudoun, Chair Randall is trying to rig the voters out of a choice in the 2019 primary. Voters decide elections not elected officials. These shrewd tactics show Loudoun Democrats want to pick candidates who will make 2019 about national politics, not local issues. They don’t want a local race, because local Loudoun Republicans are delivering results: new roads, new libraries, new parks, lower taxes, more jobs, and larger investments in education. The Loudoun County Republican Committee plans to announce its candidates after primary voters choose them next year. This is very helpful. I would like to hear more from the Republican party as the democrats seem to run wild in this and other online local sites with no response from Republicans let alone the party. It would also be helpful to explain more about who funds and organizes the ludicrous hired mob protesters who darken my commute home on Route 7 with vile attacks against the President and any local serving Republican such as Barbara Comstock. Are these even locals? Do they work and pay taxes because I don’t see how someone manages to do this and hold a job? Sounds like a good story for a newspaper journalist …. oh, right, there aren’t any. Republicans are being run over in this area and we need a more vigorous response to the vile race-baiting, sexist tactics of the democrats. If anyone is surprised by Randall’s behavior they have not been paying attention. Has there ever been a more divisive Chair, NO! Wow! This is the “argument” from the republicans? ! 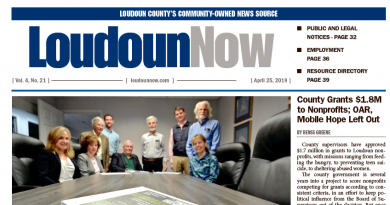 Loudoun County is now blue, and the upcoming 2019 elections will show a major change on the Board of Supervisors because of that. So, I also would guess that all republican candidates will be selected by a public primary. After all, how else do you explain that letter writer’s position. So, which incumbent republican supervisor will be challenged for the nomination? How many candidates will there be to challenge Plowman and Chapman? Or challenge Roger Zurn and Bob Wertz? Does this mean that the republican party is in total disarray? What fun! So dems have won and no republican voices should be heard? Let the tax and spending begin as freedom and liberty disappear. If people think that what happened to Michael Flynn won’t happen to them, just look what Lois Lerner did to republicans who dared to donate to their party. There’s a lot to fear from dems like Lawgh who thinks politics is a game where there are winners and losers. I would prefer a place where we all try to live together without desperately clawing for power by smearing and bad mouthing our opponents. I challenge Lawgh to come up with a single republican idea he would support. And by the way what our the democrat ideas except demonizing republicans and taxing and spending other people’s money? My, my, where to start. Patriot: If republicans that have run in this county, are the same ones who run again, I can safely say that I would never, never, ever, and hold my breath till I turn blue, vote for a republican. And as to the temptation to lecture, perhaps before one accuses democrats of demonizing republicans, the complainer should stop demonizing democrats. And, of course, for my very good friend David Dickinson, go back and read the letter. What the argument is, is that the a republican nominated candidate is not “endorsed” as a republican candidate. A republican candidate is the “nominee” of the republican party. UNLESS, of course, you have let the cat out of the bag, and there is treachery to be hatched by the republican committee in that the committee will refuse to “endorse” a nominated republican candidate, if the republican committee members do not like the nominated republican candidate. Wow, that would be fun to watch. OR, is it that the republican committee has put the word out that only incumbents will be nominated, which is what appears to be the case by the letter writer, in which case, the cat is again, out of the bag. I never knew there was a timeline for political campaigns. Is there a code for this, I’d like to know?